The Government is to look at the possibility of banning up to 70,000 used car imports as part of a major overhaul of motor taxation policy. It has responded to demands for a ban on UK imports registered on or before 2014 by expressing concerns for public health over the volume of ‘dirty’ old diesels, in particular, being brought in. The cut-off year of 2014 being asked for roughly coincides with what are called Euro6 emissions standards. A spokesman told the Irish Independent last night the focus on UK imports is part of potentially sweeping measures to ensure Exchequer returns from motoring are protected as increasing numbers of lower-tax electric cars are bought. Last year, more than 100,000 used cars were imported from the UK – the majority of them diesel. And of these, it is thought by experts that 70,000 did not meet Euro6 standards. The implications for the environment and for public health are profound as even relatively new (2015) cars spew 25pc more emissions than current models. An average four-year-old car emits 4.3 tonnes of CO2 a year. But a new car, the current Nissan Qashqai 1.5 diesel for example, emits 25pc fewer CO2s than its 2015 counterpart. The Exchequer loses out on higher tax revenues from new cars when people opt to buy a lower-tax generating import. 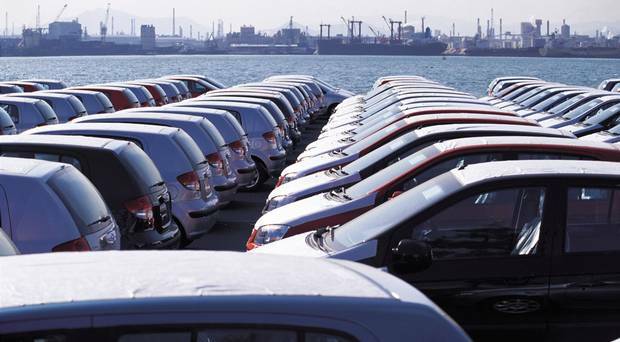 The tax take on a new car is €8,500 compared with €2,500 for a used import.